SUPREME STRONG QUALITY RIPSTOP NYLON rainfly will keep you dryer, longer with unparalleled weather protection and water shedding ability. NOT cheap and unreliable polyester. NEVER GET WET! 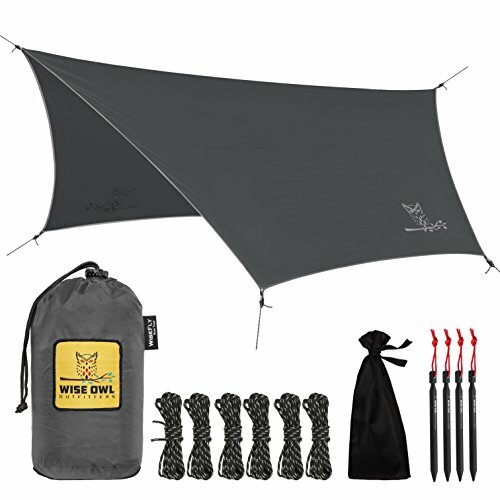 The heavy duty ultimate Wise Owl WIseFly rain tarp is bigger than the ENO ProFly tarp so you will stay dry. It’s 11 ft long by 9 ft wide but packs down to just 5″ x 9″, making it extremely easy to take with you. 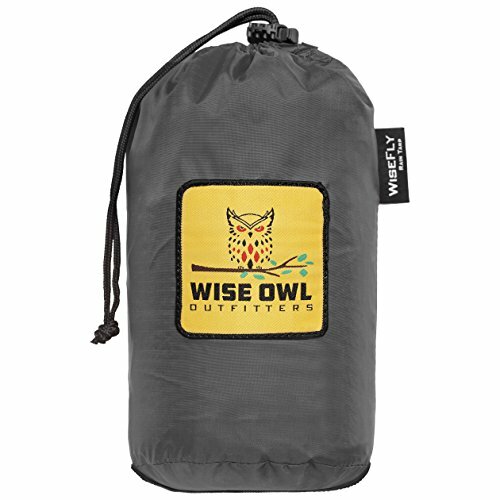 Will easily cover a Singlenest, Doublenest, SinlgleOwl, DoubleOwl & any other brand on the market. It’s a survival essential. 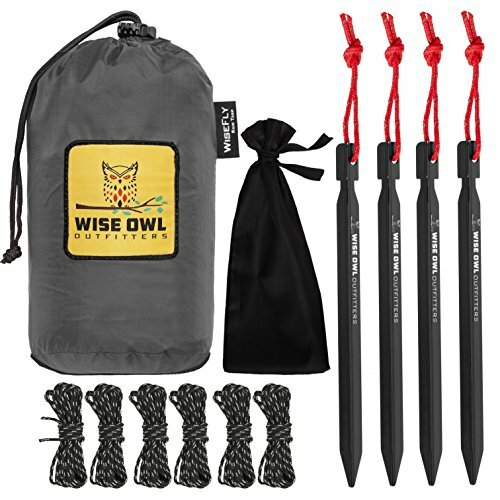 HAS EVERYTHING YOU NEED & FOR THE BEST VALUE – 4 high quality aluminum tent stakes & 6 guy tie lines that are 10 feet each that are already attached, giving you plenty of room and versatility in all different situations. *We are a family owned and operated business that loves what we do. *We are people just like you! We actually spend time in and are passionate about the outdoors. We love going to national parks and traveling every chance we get. *Being gear junkies ourselves we put a lot of thought and care into the design and functionality of our products to make sure they are of the highest quality. 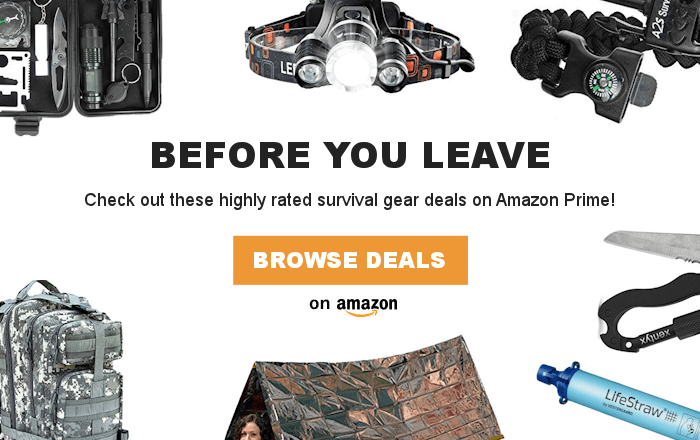 We believe that our gear is just as good as any major brand out there. *We have a 100% Money Back Guarantee. If for any reason you are not 100% satisfied with your purchase, just contact us and we will give you a refund or replace it no questions asked. *We pride ourselves on providing the best customer service you can find. You can contact us for any reason, even if you just want to talk about the outdoors. We are always available and will make sure you get amazing customer service every time! Nothing makes us happier than seeing someone using our products. If we can make your day a little better and your world a little brighter by giving you a reason to get outside and experience our beautiful planet, then we have done our job. We can’t wait to hear how you’re enjoying your gear. We hope you give our products a try and don’t forget to go on an adventure every chance you get! 100% SATISFACTION GUARANTEE = NO RISK – Don’t take our word for it… just look at our camping hammocks with thousands of reviews. You don’t have to wonder if you are risking your hard-earned money. If you don’t love it just let us know. We take great pride in taking care of our awesome customers. Copyright © My Green Terra. All Rights Reserved.